SOHO SCENE 59-60-JAZZ GOES MOD. Soho Scene 59-60 Jazz Goes Mod. Label: Rhythm & Blues Records. Ever since the birth of rock ’n’ roll, youth cults have come and gone,with some proving to be nothing more than passing fads, that nowadays, are mere footnotes in cultural history.There are some youth cults that have endured, and played an important part in British culture. However, none of the youth cults of the past sixty years have enjoyed the same longevity as the modernists. The modernists came to prominence in the late fifties, and their name came about because of their love of modern jazz which was celebrated on Soho Scene 59-60 Jazz Goes Mod which is a new four disc box set. It features seventy-eight tracks from Joe Harriott, Stan Tracey, Tubby Hayes Quartet, Art Blakey, Charlie Mingus, Horace Silver, Jimmy Smith, John Coltrane, Larry Young and Lee Morgan. These tracks are a reminder of one of the most enduring youth cults, the modernists, who were soon to become the mods. However, music was only part of the story for the mods. Image was everything for the mods who carefully tried to cultivate an air of coolness, and saw themselves as men about town. The mods often wore tailor-made suits which were sometimes made out of cashmere which usually featured narrow lapels. They also sported button-down collar shirts, thin ties and wool or cashmere jumpers. All this was part of the image for the mod around town. So too, were fishtail parkas, desert boots, Chelsea boots and bowling shoes which was part of the uniform for the self-respecting mod, who unlike members of most youth cults, even had their own mode of transport. This was the scooter, and especially the Lambretta or Vespa scooters which quickly became the mods favoured mode of transport. This transported them around town as they visited their favourite haunts, which were dance-halls, coffee bars and cinemas. At cinemas, mods took to watching French and Italian films which was all part of a sense of continental coolness they were attempting to cultivate. Image was everything to the mod, and so was music, with the two going hand-in-hand. By the 1960, music was starting to change in Britain was changing, but still modern jazz was hugely popular. That had been the case for much of the fifties. However, by the late-fifties, American bebop had started to influence many British jazz musicians, and this led to British jazz splitting in two. On one side were the musicians who eschewed the changes in British jazz, and continued to play traditional jazz (trad jazz). They resisted and in some cases resented modern jazz, but before long, trad jazz would cease to be relevant and was no longer popular. It was seen as yesterday’s sound, unlike modern jazz. By 1960, many more British jazz musicians were embracing modern jazz, and turning their back on trad jazz. They had been influenced by bebop and realised that modern jazz was the future. British jazz was thriving, with Harry South, Tubby Hayes, Ian Carr, Tony Crombie and Hank Shaw all familiar faces on the British jazz scene alongside Jamaican born jazzers Joe Harriott. Modern jazz was also the music of choice for the discerning mod, and provided the soundtrack to their evenings and weekends. Those that lived in London, would often head to Soho, which was home to many jazz clubs, while others headed to The Flamingo in Wardour Street, Ronnie Scott’s in Gerrard Street or The Marquee in Oxford Street. Some mods were lucky enough to see Miles Davis who played ten concerts in Britain during 1960. Others were left looking for his latest album which they were keen to add to their burgeoning collection of modern jazz. Many mods made weekly pilgrimages to their local record shops where they searched for the latest modern jazz releases by the top American and British musicians. This includes the seventy-eight tracks that feature on Soho Scene 59-60 Jazz Goes Mod box set. There’s nineteen tracks on disc one of Soho Scene 59-60 Jazz Goes Mod that were released by British jazz musicians and groups in 1959. It opens with Wilton Gaynair’s Wilton’s Mood, and transports the listener back to 1959 and the early days of the mod culture. Among the other highlights of disc one are Joe Harriott’s Senor Blues, Vic Lewis’ Beaulieu Blues, British jazz pianist Stan Tracey’s We’ll Call You and the Tubby Hayes Quartet ’s Blue Hayes. It’s a reminder of one of the great British tenor saxophonists. Closing disc one is The MJ6 and atmospheric Tracy’s Theme, which closes the disc on a high. 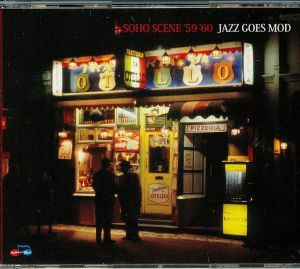 Opening disc two of Soho Scene 59-60 Jazz Goes Mod which focuses on American jazz from 1960, and opens with Art Blakey’s No Hay Problema and then Harold Land’s Blowin’ The Blues. These two tracks are a tantalising taste of what’s to come. This includes Charlie Mingus’ Boogie Stop Shuffle, Horace Silver’s Sister Sadie and Jimmy Smith’s The Sermon which are joined by Mr Billy Paul’s Go To Hell, John Coltrane’s Naima and Cannonball Adderley’s Grand Central. Then there’s Herbie Alpert’s Viper’s Blues and Mr Lee’s hidden gem Mr Lee’s Plea. Disc three of Soho Scene 59-60 Jazz Goes Mod looks at British jazz from 1960. It opens with the cinematic jazz of Harry South Big Band ’s Southern Horizons. The tempo drops on the smoochy late night jazz of Vic Lewis’ Little Darlin’ before the tempo rises on the Joe Harriott Quintet’s workout Tuesday Morning Swing. Other highlights include the Jazz Couriers ‘ Too Close For Comfort, Tubby Hayes ‘ St Vitus Dance and Little John Anthony ’s Midnite Jump. Closing disc four is Ken Jones ‘ Bluesville which has stood the time and is a welcome addition to the box set. On disc four of Soho Scene 59-60 Jazz Goes Mod, the compilers turn their attention to American jazz in 1960. Oscar Brown Jr’s But I Was Cool is a disappointing start, but things soon improve with Nat Adderley’s Sack Of Woe, International All Stars ‘ African Dance, Lee Morgan’s Terrible T, the Rune Overman Trio’s Funky Festival and Larry Young’s Young Blues. That is not forgetting Jimmy Smith’s Back At The Chicken Shack and Willis Jackson ’s Cool Grits which closes disc four of Soho Scene 59-60 Jazz Goes Mod and the box set on a high after seventy-eight tracks. For the original mods, the music on Soho Scene 59-60 Jazz Goes Mod box set is sure to bring back memories of modern jazz that they listened to during their glory days. These tracks were part of the soundtrack to the lives of the original mods, and were then rediscovered during the mod revival in the seventies. By then, the music on Soho Scene 59-60 Jazz Goes Mod was just part of a larger musical soundtrack during the first mod revival. As the sixties progressed, mods embraced everything from soul, R&B, reggae and ska, which beams part of the soundtrack to their lives. This was the case during the first mod revival in the seventies and subsequent mod revivals. However, for the original mods, modern jazz and the music on Soho Scene 59-60 Jazz Goes Mod. is something they hold dear, and which brings back memories. For the original mods, the music on Soho Scene 59-60 Jazz Goes Mod is sure to bring back memories of wearing mohair suits, button down shirts, fishtail parkas and riding a Vespa to the coast on Bank Holiday weekends. During these long, hot holiday weekend in 1960, the mods enjoyed a soundtrack of the modern jazz, but never imagined that they were part of what would become one of the most important youth cults in British cultural history. The modernist or mod movement has enjoyed an unrivalled longevity, and outlasted the majority of youth cults. Although there was only one mod revival in Britain in the late-seventies, and one in America in the late-eighties, parts of mod culture have endured since then. Especially some of the clothes, and of course the music, with compilations of mod or modernist music being regularly released. This includes Soho Scene 59-60 Jazz Goes Mod which has just been released by Rhythm & Blues Records and is sure to bring back musical memories for former mods of all ages and vintages. ← THE ART ENSEMBLE OF CHICAGO AND ASSOCIATED ENSEMBLES.